I've shared a plethora of desserts with you here on the blog. This one, though ... this one is pretty darn scrumptious and one that just might "take the (cheese)cake." I didn't necessarily set out to create a mind-blowing, so-good-ya-need-to-smack-yer-momma type of recipe with this one ... I was simply working this past week in the kitchen testing out some different ideas that I had for incorporating coconut into cheesecake. I wanted something simple. I wanted something that didn't require the oven be fired up. (It is mid-August after all.) And, I really wanted a cheesecake that I could work coconut into in a few different ways. I adore the flavor of coconut - especially toasted coconut. And, I adore cheesecake (but, I usually hate the hassle of making it from scratch). So, I tinkered around with a few boxes of no bake cheesecake mix (found in the pudding and gelatin section) that I had stashed in my cupboard. (What a time-saver.) This recipe, basically, takes a couple of boxes of cheesecake mix (no shame in my game) and turns them into magical, coconut-y bliss in the form of mini cheesecakes. I truly do prefer to make things from scratch in my kitchen. But, as a busy mom, wife, blogger and super hero (ha! ), I, occasionally, take a little help where I can get it when I'm in a hurry (or just feeling lazy). Typically, though, if I do use a boxed mix of some sort (like cheesecake mix or cake mix), I put my own spin on things. Jazz it up. Make it my own. For this recipe, I fancied up the crust by incorporating some crushed pretzels and coconut oil (in addition to the butter) into the crushed graham crackers included in the boxed mix. I, then, subbed in canned coconut milk in place of the regular milk. 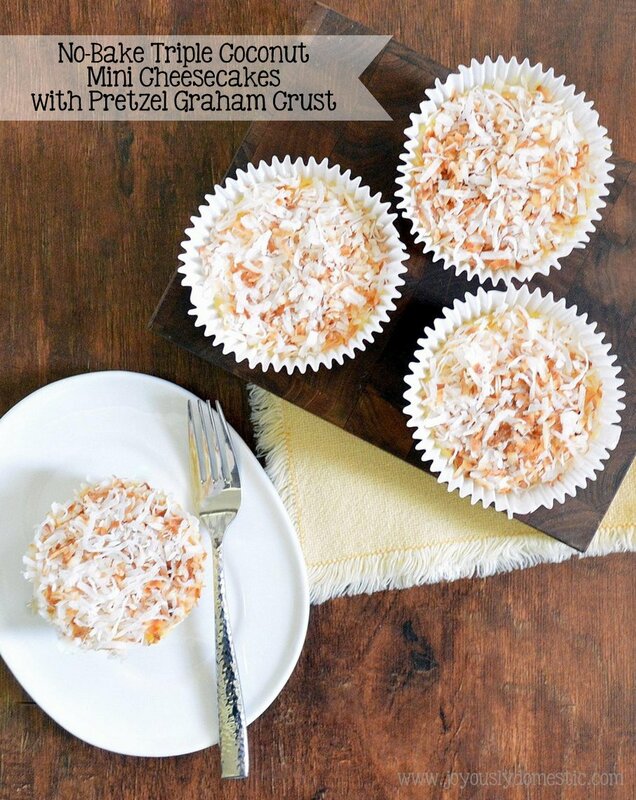 Finally, I topped the cheesecakes with toasted coconut. When it all comes together, it is heavenly. A little saltiness is present in the crust due to the pretzel inclusion. The cheesecake is ultra creamy and luxurious with just a hint of coconut flavor. And, the toasted coconut brings amazing texture and really drives home the coconut flavor. NOTE: I choose to utilize my muffin tins that have jumbo/king size wells. However, this could be made in traditional muffin tins, if desired. Obviously, the result would be smaller cheesecakes, but the recipe would yield a larger quantity of cakes. Additionally, this could easily be made into one large cheesecake by using a large pie pan or medium size casserole-style glass dish. In a small saucepan set over low heat, gently toast coconut. Watch carefully and stir often. Remove pan from heat and set aside for coconut to cool. Place pretzels in a large zip-top plastic bag. Seal. Crush pretzels with rolling pin. Open bag. Add in both packets of crushed graham crackers from cheesecake mix boxes. Add in sugar. Melt butter and coconut oil in a small bowl in microwave. Pour melted butter/coconut oil into bag. Seal. Massage butter into crumb mixture until well-incorporated. Shake bag as needed while massaging. Set aside. Line 8 wells of your muffin tin(s) with paper liners. Equally distribute the pretzel/graham cracker mixture between the wells. Using the bottom of a small cup, press firmly into mixture to compact crust evenly. Set aside. In a large mixing bowl, whisk together both packets of cheesecake mix with coconut milk. (Electric mixer can be used, if desired.) Whisk/beat until filling begins to thicken. Equally distribute filling on top of crusts. Equally distribute toasted coconut atop the cheesecake. Loosely cover muffin tin(s) with plastic wrap. Refrigerate, at least, 2 - 3 hours prior to service.